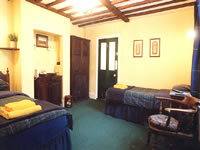 St Albans Bed and Breakfast in St Albans - Fern Cottage Bed and Breakfast in St Albans, England: Charming cottage set in the conservation area of historical cathedral town of St Albans Hertfordshire. Whether your visit is for business or pleasure a warm welcome awaits you at Fern Cottage. A charming dwelling built in 1858 and set in the conservation area of this bustling ancient Roman city. Each beautifully decorated room has an individual style. 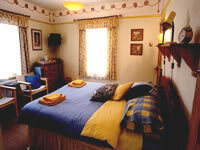 All rooms are ensuite with cable TV and drinks making facilities. We are within walking distance of the cathedral and town centre and main line station. London is a mere 20 minute journey. Off street parking available. Ideally located for access to M25 and M1. The City, named after St Alban, the UK's very first Christian Martyr, is a treasure-chest of historic buildings, museums and artefacts. The Verulamium, the Clock Tower and the imposing Cathedral are all worthy of a visit. Add to this, modern shopping precincts ,twice weekly street markets and a multitude of restaurants and hostelries and visitors soon see why St Albans has so much to offer. Cathedral, golf course shopping , restaurants.